Mixing the beauty of Christmas with the beauty of the beach may seem like a tall order to some, especially if you live in a country that doesn’t see much sunshine during the winter months. But now with international business a big deal for plenty of businesses perhaps you will want to wish those of your customers that live within a sunnier climate just as merry a Christmas as those that are experiencing a chillier season. That is where Christmas On The Beach ecards can work for you. One of our e Christmas cards for business that steps away from the more traditional holiday cards that you see in shops around the world and presents to you something a little different. 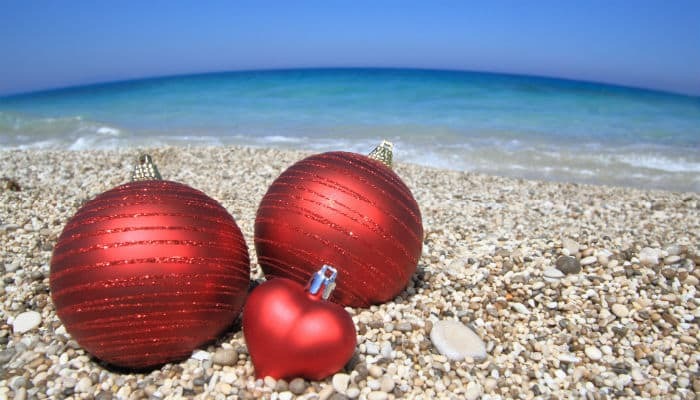 These e cards features 3 red baubles with just a sprinkling of sparkle nestled amongst a shingle beach. Perhaps not the normal image that you think of for Christmas time! So when it comes to creating customised business Christmas ecards don’t be afraid to take one giant step away from the rest of the crowd and market yourself as a company that is proud to offer something a little bit different. We can guarantee that you won’t regret it!